The University’s information technology governance structure advises on IT strategies, priorities, services and investments. The structure was established in 2012 to make decision-making about IT at the University more comprehensive and holistic, and to engage key stakeholders across the University in making recommendations on IT decisions and directions. 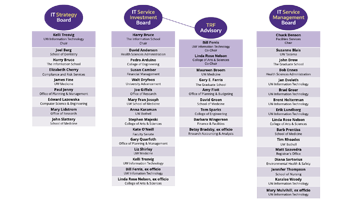 The IT Strategy Board provides strategic direction on IT issues and investments at the University and is responsible for providing oversight of major IT projects, service improvements and infrastructure investments. The IT Service Investment Board makes recommendations about services provided by UW-IT, including priorities for major UW-IT projects, and conducts an annual review of the Technology Recharge Fee. The Technology Recharge Fee (TRF) Advisory Committee supports the IT Service Investment Board in its annual assessment of the TRF by providing in-depth analysis, identifying issues and making recommendations. 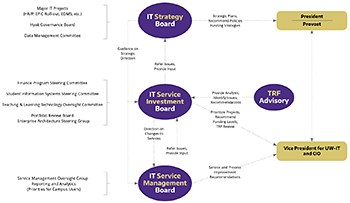 The IT Service Management Board ensures alignment of UW-IT services with institutional IT strategy and priorities, as identified by the other two governance boards, and optimizes the design, delivery, operation and sourcing of those services. All UW Enterprise IT projects report their status and progress quarterly to facilitate oversight and governance. These reports are reviewed by the IT Strategy Board as well as other IT governance boards, the Vice President for UW Information Technology and CIO, the Washington State Office of the CIO, and others as needed.